The Carmarthen Library was originally competed in 1995 at a cost of £1.3 million, and it has not had a significant refurbishment or review since. 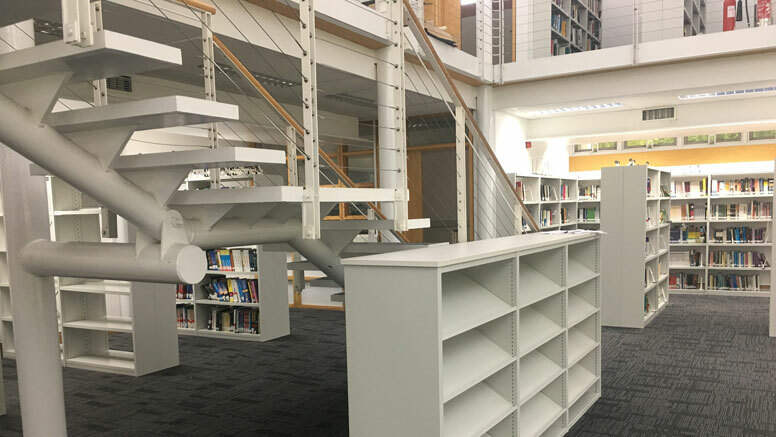 However due to the Y Fforwm development the university took the strategic decision to invest in a full refurbishment of the Carmarthen Library as part of wider campus investments which were and are primarily around ensuring equity of provision across the university. The building itself is considered an iconic Welsh university library but had suffered over the years due to its complexity which meant some levels of maintenance had been a challenge. The project aim was to replace all carpet, shelving, study desks and chairs, and the information desk as well as review lighting. In addition, the intention was to remove an unused rolling stack and areas of the collection, which were under-utilised and no longer required. This would create more study spaces, and the opportunity to be more creative with the kinds of learning spaces the building could provide. The project also involved external maintenance to the structure, as well as reviewing the power and data into the building, and adding where required. The new information desk was hand made locally, and is bespoke. We also embarked on a significant collection refresher as part of the project. Colour theme reflects the rural nature of the campus and library, as well as the structure itself. It also now more closely aligns with other libraries within the university estate in terms of ‘look and feel’, as well as overall space vision and interpretation. We also commissioned a new art installation as part of the project, and this was completed by our re-opening on the 4th Sept. 2018; we had closed at the end of June. The artist is http://laurathomas.co.uk/ This textile piece reflects the rural nature of the campus primarily, but also the library itself as it sits in a mature garden, which adds hugely to the sense of peace, light and calm of the internal design. We also now have a library sheep! Group study spaces, Open learning provision, Specialist subject collections, Exhibition display areas, Meeting rooms, Provision of special materials. The original building design was focused around the exposed steel frame and large sections of glazing, the refurbishment was focused around the glazing to allow as much natural light in to the space. The building was designed to eliminate the use of mechanical cooling and reduce energy consumption. In order to limit solar gains the building has large overhanging roofs with solar louvres. The roof itself is ventilated and cooled through an integral cavity. It was designed to make maximum use of natural light, reducing internal heat gains and energy costs. Radiant panels in the roof are the heat source, which allows for maximum use of the floor and wall area. Salix funding allowed us to upgrade the existing inefficient boiler to a more energy efficient boiler. Also funded the upgrade of lighting to LED. RFID, WiFi, charging points, device lending, 8 computer terminals.